There’s a stone monolith that stands sentry over the Columbia River in Washington, a striking sight whether you spot it from across the river in Oregon or pass directly under its shadow on the Lewis and Clark Highway. This jagged chunk of basalt towers overhead, jutting out over the river, promising long views of the Gorge from the top, and the chance to be close to something ancient and seemingly impervious to nature. It looks impossible to climb without ropes and pitons, and it’s not until you walk right up to it that you notice a catwalk skirting the side, an irresistible invitation for the casual hiker to climb up. Lewis & Clark named it Beacon Rock on their way to the Pacific in 1805, and a century later Henry Biddle bought it, saving it from being pulverized and used as a jetty (oh people, what were you thinking?). This “young” volcano erupted 57,000 years ago, then was exposed by ice age floods that stripped softer rock away, and now the inner core of cooled hardened lava remains. Biddle built a trail so anyone and everyone could climb to the top, and later his children donated it to Washington state. Thanks Henry. The path to the top is a mile hike pretty much straight up (850 feet high) and includes 53 switchbacks! Several vista points along the way means I can stop and pretend I’m not out of breath, just enjoying the view, really. And what a view. Looking west towards Portland 35 miles away, the river winds circuitously between the two states. Just below us, a large State Park campground hides under a canopy of green with a smudge of campfire smoke hovering just over the treetops. Hikers, rock climbers, equestrians, bicyclists, and folks who fish or boat all use the campground as a base for further adventure. To the east is a birds-eye view of the Bonneville Dam, built in the ’30s and named for one of the Oregon Trail trail blazers. One of 14 dams on the Columbia, it provides electricity for a half million homes. It’s not so great for the salmon though, even with all the mitigation work to reduce the impact. Beyond that, layers of mountains touch the sky, and Fall clouds color the landscape, changing the hues, moving our focus. Far below are the heavily traveled train tracks, with strings of colorful toy-like freight cars carrying goods up and down the river. 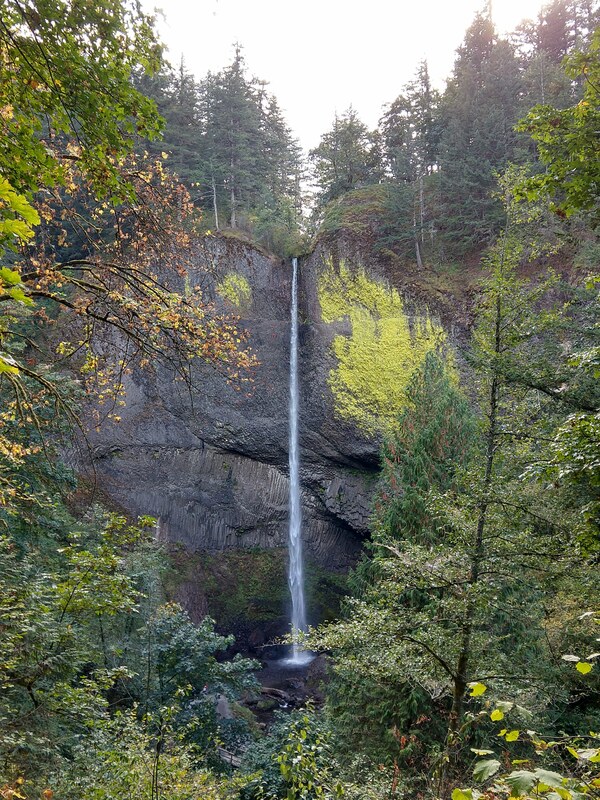 South across the river to Oregon, multi-colored cliffs rise majestically above the river, and swaths of brown dotted with new green growth extend along the burn area from last year’s Eagle Creek fire. And in all directions, hills and mountains are speckled with the season’s emerging yellows and reds, just getting started into the eventual fiery glow, a reminder of one of the reasons I moved to the Pacific Northwest. We pass a few hikers along the way (it was neither Oregon crowded nor California crowded), including a few hardy middle aged folk, some virile young adults, a strong mama packing a baby, and a runner with his dog. A couple with young kids make their way down with enthusiastic shouts. A hefty middle-aged couple breathlessly join us at the top and tell us about hiking to this spot many years ago on her due date, trying to get things going. It did. Then comes a line of a dozen “retirement-age”people, part of a Friends of the Gorge group, and I’m reminded that I want to look them up and perhaps join their ranks. The Friends offer outings and education, and support the upkeep and restoration work that keeps the Gorge open for all. Some carry trekking poles which reminds me to look into that as well – my retirement-aged body calls for assistance on these steep, rock-strewn paths. The air is crisp and a chilly wind blows off the water on the river-facing side of the rock, but on the lee side it’s warm and still. With the dry weather, the views, the short distance, and the fall colors, it’s the most pleasant straight up hike I can remember. After our hike we cross the river on the Bridge of the Gods, winner of the best named bridge ever. We eat lunch in the town of Cascade Locks, a pleasant little river community nestled up to the bridge. Though there’s a chilly breeze, we grab a riverside table for an unhindered view of Washington’s hills. The wind whips ripples upstream on the water’s surface, fooling me into thinking the current has turned backwards. Eddies circle in endless patterns as a few seagulls wheel overhead. Food and drink always taste better outside, and we raise a glass to the glorious Pacific Northwest. The drive back along the Oregon side is always a thrill, nestled between the river on one side, and the shadow of the cliffs on the other. The river changes constantly, sometimes narrow, sometimes wide, alternately glassy, calm or wild depending on the wind, the bends in the river, and the many small islands dotting the way. Turning from the main highway to the narrower Historic Highway puts us squarely into forested lands, winding closer to the cliffs toward the many trailheads, several still closed from the fires. 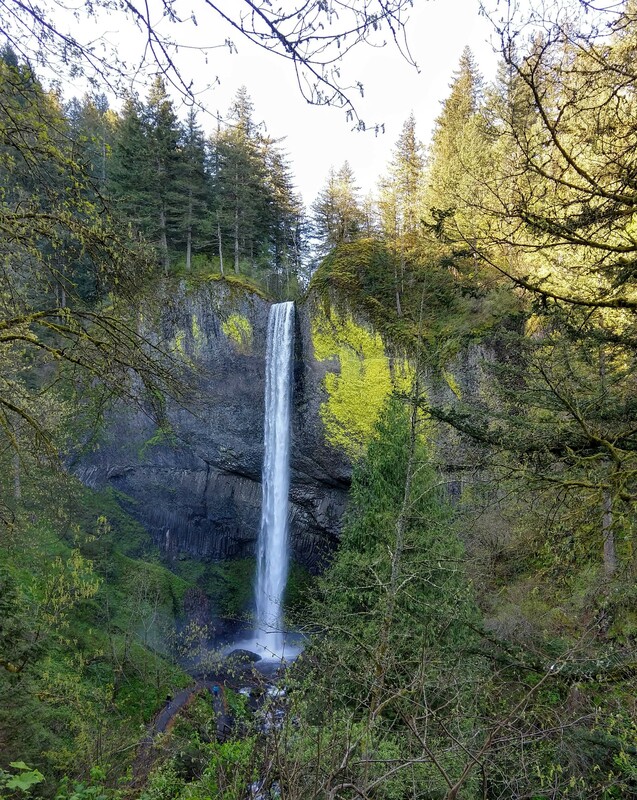 Latourell Falls was one of the first areas to reopen last spring (I wrote about it here), and I’m drawn back to see the contrast of the seasons. Paths are now sprinkled with leaves but not yet muddy, wildflowers are sparse, trees are beginning to sport brilliant shades, and the waterfall is somewhat less exuberant, though still a big thrill (comparison photos above). Even after four years of being around Oregon’s ever-present running water I’m delighted to see and feel the roar of water plunging helter-skelter down the cliff, dramatically pounding the rocks below, spray bouncing up, then coalescing into quiet pools and riffling down the creek bed. We happily stroll along all kinds of waterways, enjoying the flow, the burbling sounds, the sweet air above and around. But it’s the waterfalls that mesmerize and draw us in, a primal force. Visitors edge closer, crawl over branches, clamber over slippery rocks, compelled by the explosion of water, craving contact with the fine cold spray at the bottom, and risking a bit more just to be in communion. The basalt formations in the cliff behind the falls make a honeycomb of textures, adding an otherworldly quality to the place. 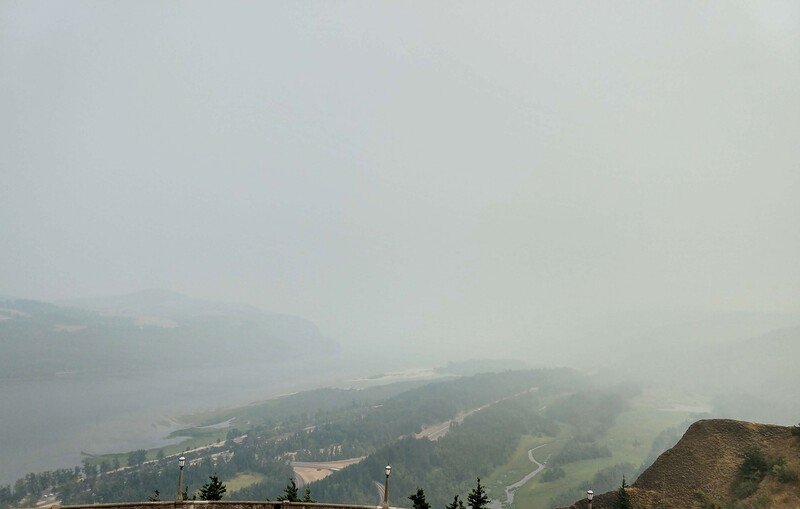 We continue west, stopping at Vista House where visibility and weather change the views from one visit to the next. 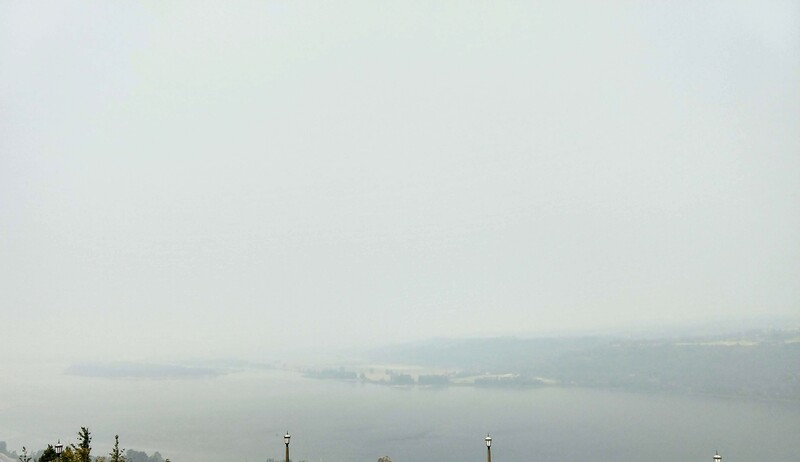 When I came with family visitors this past summer I was disappointed to see the whole river valley shrouded in a thick mantle of smoke from the horrendous and pervasive summer fires along the entire west coast. Today we see a long way up and down the Gorge, an equal and opposite perspective from Beacon Rock, with a backdrop of Washington’s rolling hills spread underneath a bit of mist and scattered clouds reflected in the water. I return over and over for a piece of this transcendence, away from my own crazy, away from the world insistently insinuating itself, moving toward my center and hopefully toward and beyond the infinite. Sigh, how gorgeous landscapes. Thank You.